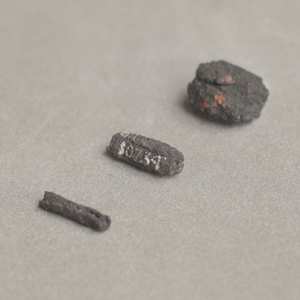 Researchers have shown that ancient Egyptian iron beads held at the UCL Petrie Museum were hammered from pieces of meteorites, rather than iron ore. The objects, which trace their origins to outer space, also predate the emergence of iron smelting by two millennia. Carefully hammered into thin sheets before being rolled into tubes, the nine beads - which are over 5000 years-old - were originally strung into a necklace together with other exotic minerals such as gold and gemstones, revealing the high value of this exotic material in ancient times. The study is published in the Journal of Archaeological Science. Professor Thilo Rehren (UCL Archaeology, Qatar), lead author of the paper, said: "The shape of the beads was obtained by smithing and rolling, most likely involving multiple cycles of hammering, and not by the traditional stone-working techniques such as carving or drilling which were used for the other beads found in the same tomb." The team's results show that in the fourth millennium BC metalworkers had already mastered the smithing of meteoritic iron, an iron-nickel alloy much harder and more brittle than the more commonly worked copper, developing techniques that went on to define the iron age. As a result metalworkers had already nearly two millennia of experience of working with meteoritic iron when iron smelting was introduced in the mid-second millennium BC. This knowledge was essential for the development of iron smelting and the production of iron from iron ore, enabling iron to replace copper and bronze as the main metals used. Excavated in 1911, in a pre-dynastic cemetery near the village of el-Gerzeh in Lower Egypt, the beads were already completely corroded when they were discovered. As a result, the team used x-ray methods to determine whether the beads were actually meteoric iron, and not magnetite, which can often be mistaken to be corroded iron due to similar properties. By scanning the beads with beam of neutrons and gamma-rays, the team were able to reveal the unique texture and also high concentration of nickel, cobalt, phosphorous and germanium - which is only found in trace amounts in iron derived from ore - that is characteristics of meteoric iron, without having to attempt invasive analysis which could potentially damage these rare objects. Professor Rehren said: "The really exciting outcome of this research is that we were for the first time able to demonstrate conclusively that there are typical trace elements such as cobalt and germanium present in these beads, at levels that only occur in meteoritic iron. "We are also excited to be able to see the internal structure of the beads, revealing how they were rolled and hammered into form. This is very different technology from the usual stone bead drilling, and shows quite an advanced understanding of how the metal smiths worked this rather difficult material."